Now the days have become darker and the rain has started pounding on the windows, I've made myself a nest on the sofa. It started when some friends visited last weekend. When they left, they carefully stacked the duvets and pillows from the night before on the sofa. Instead of moving them, I fell straight into the (very comfortable) trap. Obviously, aside from duvets and pillows, my nest has a large number of books and a laptop cable sneaking out to the nearest socket. All it needed was cake. This recipe was initially inspired by a cake that I've had a few times at the Vaults in Oxford - I've been meaning to make a version of it for years. The base is a soft, fluffy coconut cake that doesn't dry out. It's laced with apricot jam, which creates a subtle flavour through the cake and a sticky, slightly caramelised bottom. It's a sweet cake, but not in an overwhelming or unwelcome way. With a large mug of tea, it perfects my autumnal nest. Preheat the oven to 180C/350F. Line a 9 x 4"(23 x 10cm) loaf tin with greased parchment (or as I used here, greased parchment lined foil). Place the butter and sugar in the bowl of a stand mixer (or a mixing bowl if using an electronic hand whisk) and cream until light and fluffy - this takes at least four or five minutes. Sieve the flour, baking powder and salt together. Whisk the eggs together. Add the egg in small additions to the creamed mix, making sure you beat in between each addition until the mixture has totally incorporated the egg you've added - add a tablespoon of flour about half way through and again near the end to help prevent curdling. When you've finished the egg, add the rest of the flour mix and the coconut and briefly beat to combine. Add the milk and vanilla and stir briefly again until you have a uniform mixture. Spread 3 tbsp of the jam over the bottom of the tin. Scoop 2/3 of the cake batter on top and level it. Swirl in the remaining 3 tbsp of jam then top with the rest of the cake mixture and level off again. Bake for 45-55 minutes until deep golden brown and a toothpick/skewer can be removed cleanly from the middle. Combine the jam and water for the glaze in a small saucepan and heat until you have a syrup. Brush it over the top of the hot cake, using all of the glaze. Sprinkle the coconut over the top. Leave to cool in the tin for 5 minutes then lift out onto a wire rack to cool. Keeps for 3-4 days in an airtight tin. Oh my gosh! I love the cake at the Vaults! It's my favourite there, and I order it again and again. So glad you've 'cracked' the recipe! :) I will definitely try it. Oh my this sounds delicious!! I adore coconut and I bet it's just wonderful paired with apricot jam. 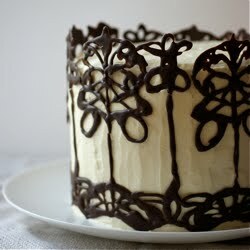 This cake looks perfect - totally moist and full of fun flavour! I've just made it and its baking in the oven... however I substituted the apricot jam with raspberries and raspberry jam, it might turn out a bit sweeter than your's, but that won't be a problem in my house ;-) Thankyou for the recipe! I hope you like it! I haven't had a slice for a few months so I'm not sure exactly how similar it'll be - I went for the overall idea really. It is lovely and moist (however much I hate that word...). Glad you like it! It's a lovely combination. I think it'd make a nice coconut layer cake, too, if you baked it in sandwich tins. Ooh, how did it go? Did you use fresh raspberries? Did you put them in the middle and the bottom? So pleased you were inspired to make it immediately. Thanks Ruth! I'm glad you like it. I used some frozen raspberries stirred through the warm jam and just followed your instructions for the rest, it turned out gorgeous! So moist, if I lived in England it would be so good with clotted cream. I think that extra sweetness of the raspberries turns it in to more of a dessert :) Thanks again Emma! This cake is simply yumdiddlyscrumptious. I baked it this afternoon and have had two slices already. Really very easy to make...I had to cover mine with some foil after about 30 mins on 180c as it was already golden brown. You are an absolute inspiration Emma! It looks yummy! Can't wait to make it. Where did you get the greased parchment lined foil? I did an online search but had no luck. Hehe - a cosy space to semi-hibernate in is essential at this time of year. I'm glad you like it - I love a good loaf cake. Ooh, how did it go? Homemade peach jam sounds amazing. I'm so pleased it went well! I've never had to cover mine with foil but that's a good point - another lady made the cake and posted a picture on FB and it does look pretty dark. I'll add a note to the recipe. I thought you might! Finally got my act together. Do you live in the UK? I've found it in supermarkets and Lakeland here and on amazon. Also, I greased it myself, so a search for parchment lined foil might come up with more results. Definitely - each oven is different. Generally it's best to not open the oven until 2/3rds of the time has gone. I feel honoured that it was the first cake in your KA! Which colour did you go for? It turned out really well - it's a beautiful cake! I was really struggling to wait a bit for it to cool before I could try it! I think it's definitely better to eat it as fresh as possible though - I've had it in a tin for a couple of days and the bottom has gone back to being a bit more jammy, rather than sticky and caramelised. Still tastes good though. Thank you, this is an incredible recipe. Tastes and smells beautiful, and I feel very chuffed! Appreciate you sharing this with us all. I'm so pleased you like it, that's great! Thanks for letting me know, I love hearing how things go. Ooh snazzy! I have a candy apple red one (though I didn't choose the colour as I won it in a competition). That's great, I'm so glad you liked it! I quite like the jammy bottom so I'm happy to eat it a few days later but I get what you mean. I was taught to make jam by my granny and my mum- it's great when you can pass on things like that. These look amazing! I love anything with treacle in- I'm going to be making a yorkshire parkin this week for that exact reason! I love the lore of these scones and their ingredients almost as much as the scones themselves! I adore the sound of these! I have never, ever tried treacle but in my mind it would taste like Lyle's golden syrup. Thanks for another wonderful recipe! That's interesting, thanks for pointing it out! I'm glad you think so - they were a nightmare to photograph. The sugar on the outside gives them such a lovely crunch. There's something about the flavour of treacle, isn't there. Parkin sounds like a lovely ida. I'm so pleased you enjoyed it - I loved working it all out and finding all the links and things. Treacle actually tastes quite different to golden syrup - it's black and really quite strong. Once it's baked into something it mellows out. It's a similar flavour to very dark brown sugar but intensified. I loved this post Emma - from the sound of the treacle well to all the historical information behind the purported healing powders from the treacle well. I started experimenting with treacle the other week (after finally finding it in a delicatessen here in Rome) but have yet to develop a recipe I liked (for some recipes I found the flavour overpowered everything else). I do like the sound of these though - well, you can never go wrong with a scone and some melted salted butter! I'm so pleased you like the post. Treacle is an overpowering flavour really. My favourite uses are definitely things like these scones or the flapjacks where the idea is that it's front and centre. It's also good in small amounts in fruit cakes and things. What sort of things were you trying out? I love the story behind these Emma, thanks for sharing. Your scones look lovely, I love using treacle around this time of year. I'll be featuring these on my blog on a little feature I do called Baking News. Have a great day! Really enjoyed the whole post, from remembering the treacle wells, to the history behind the well in Oxford, a very appealing recipe and beautiful pics as always. I love treacle and love these scones. Just beautiful! Thanks for the feature, I'm glad you like them. I definitely go through more treacle in the winter too. Thanks Sally! It's lovely to hear that you enjoyed the post. What a nostalgic treat - these scones look delicious and feel like they are from another age. In a beautiful way.They look delicious. Such an informative post - I've heard of "thunder and lightening", regular scones with black treacle and clotted cream but never thought of adding the the treacle to the scone mix - what an interesting idea. The apricot goes really well with the coconut - it's a lovely combination. I think the Vaults in general comes into its own on dark winter afternoons - their stews and rices are perfect. I hope you do make the cake - let me know how it goes! They are quite old-fashioned and homey - they certainly aren't jazzy (or particularly easy to photograph appealingly!). They're still delicious, though. The treacle gives them such a fantastic flavour. I've never had the proper thunder and lightening scones but we used to have thunder and lightning ice cream when I was a child that was honeycomb and clotted cream - so good! Emma, I don't think treacle is something we see here in the US. But now I need to go on a real search. I imagine your scones have a wonderful rich dark flavor. Getting hungry now. And isn't it fun to discover old family cookbooks? I keep reading through some books that were my Greek grandmother's and I'm itching to cook from them. I think they may have it at Berkeley Bowl - I think I spotted golden syrup, which Lyle's also make (though I guess that's more popular). I think it can also be labelled blackstrap or dark molasses outside the UK? It is fun, isn't it! I bet the ones you have are great - are they in Greek? I wondered if blackstrap molasses was the same thing! I actually need to go to Berkeley Bowl this week. I'll do some sleuthing. The books aren't in Greek - lucky for me as I can't read a word of Greek, myself. My mom also has some great old cookbooks she has passed to me. I'm particularly smitten with one that focuses on New Orleans style cooking. I don't use treacle enough; it's such a wonderful rich and sticky flavour although I had no idea of the history behind it. Posts like this make me really hope that you'll write a book Emma. Love, love, love everything about it. What a wonderfully fascinating post! Really enjoyed it, and the recipe looks delicious, of course! Thank you! I'm so pleased you liked it. Funnily enough, this post is adapted from my first book proposal from last summer. I'm so pleased you found it interesting - I love this sort of stuff! Sounds interesting! I've never had guava jam so I can't imagine how it would taste. Do let me know how it goes, I'd love to hear. I don't see why not, though I've never tried it with coconut before. So glad you made the marmalade and like it! I ended up making it with homemade apricot and vanilla jam. It was absolutely delicious. Such a wonderful recipe Emma! Hereby know we the heart of truth, as well as the mindset of error. taken mode, and the active function.